"Unable to merge This field is required." It sounds like either the source or destination branch isn't being set when you submit the form. This shouldn't happen, so there might be something wrong with the repository. Could you tell me what repository you are try to merge? If you are uncomfortable sending posting this on this issue, you can send us an email at support@atlassian.com instead. Oh.. Just noticed, it happens when there are two heads on a branch and I am trying to compare one of the revisions with another repo. It shows the compare result, but while trying to merge, shows blank in place of branch. This is allowed and works perfectly in pull-request merge. Thanks for clarifying. I've added this bug to our backlog, and we'll take a look. I am still having this issue. When I try to sync a repo (I've earlier forked) with mine, I get the error. I am still able to send pull requests though. I also got the problem on my site. Facing same issue on https://bitbucket.org/nsathyendra/blockonomics_fork_mar9 . Same problem here, I haven't had issues before. I've encountered same issue. Few days ago everything worked fine. I also see this issue when I have sync'd using the gui many times before with no issue as recent as 3 days ago. I just noticed a new issue #11159 opened up here: https://bitbucket.org/site/master/issue/11159/unable-to-merge-this-field-is-required. It references this issue, 8835, but nothing had been updated here to redirect attention, so I thought it worthwhile. Has anyone seeing this issue had succes syncing from the terminal? Then you fetch from "upstream"
Now that your local repo is merged! Then push your changes as you regularly do. Same issue with a mercurial repo. I was unable to sync my repo with (sinbad/ogre) repo. 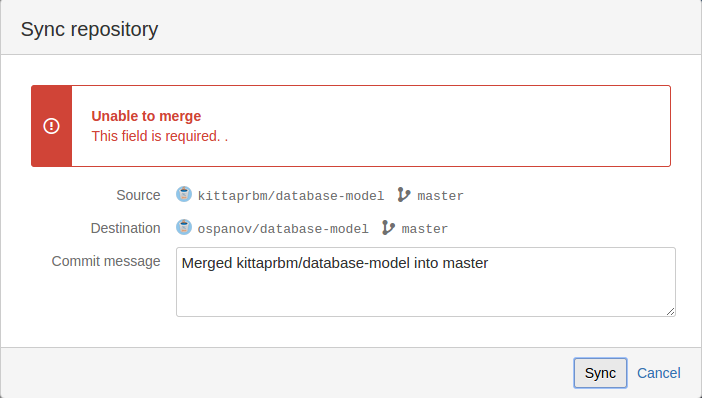 Getting error "Unable to merge This field is required. ."
Thanks Fernando, I wish the repo I was using was a git repo, (Long live Git! ), but unfortunately its a mercurial repo. abort: push creates new remote branches: fix-cg-zero-guess, sparse-tutorial-doc-fix! I am mostly posting this back here because it might give some insight into what field is missing, likely an appropriate head as is indicated from the terminal. I'll post that observation back to #11159 and try to keep updates on that active, open issue that might hopefully get a quicker assignee. I have been able to use the terminal to pull from upstream to be then be able to sync my repo successfully using the web interface, I've posted some instructions here #11159. I'm not the greatest mercurial user, but hopefully this might be helpful to anyone else trying to get their repo sync'd in the future. I fetched code from upstream. 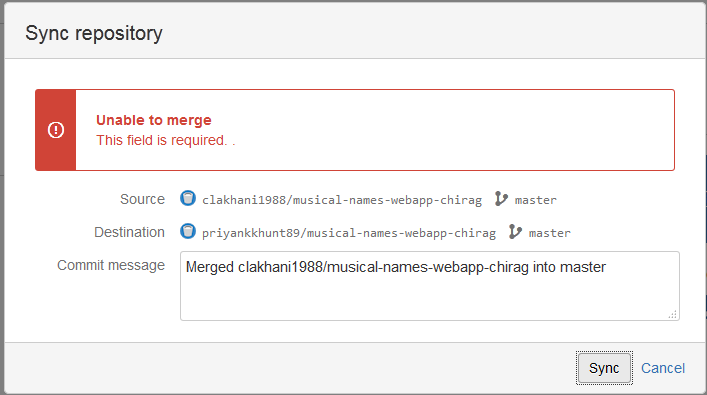 Then did git merge upstream/master. It said fast-forward. no changes at all. but web site has the sync button saying 12 commits behind. 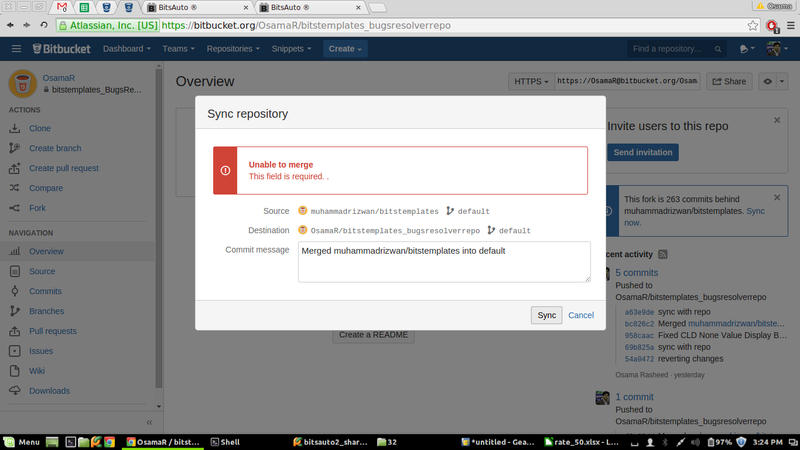 And sync fails with message: Unable to merge This field is required. . 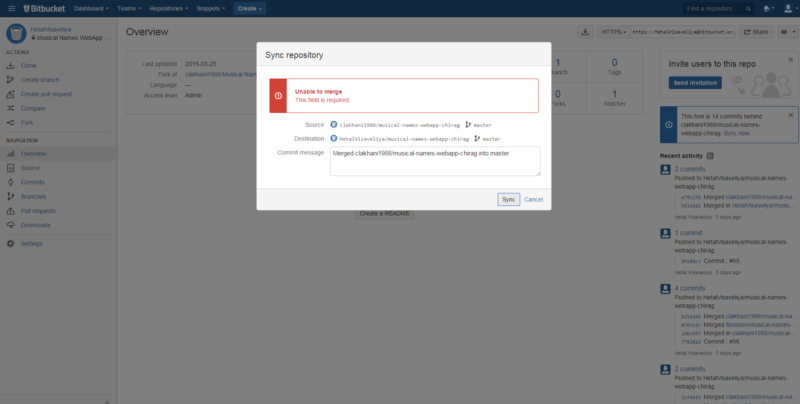 I am also having this problem when I click "Sync" on my fork of a bitbucket repo. Hello Team, I am also facing same issue. Unable to merge This field is required. . I think this issue arising due to there is blank fileds pass in hidden element in Popup for "Sync repository" Please see this code <input type="hidden" value="" name="source"> <input type="hidden" value="" name="dest"> Or my attached screenshot. Same issue when I click "Sync"
How to resolve this issue? This issue is costing me a lot. Is this a issue from bit bucket or from my repo? I got same issue too. The report from @Chirag Lakhani is right, I think. I'm experiencing this problem since this morning. I feel sorry not being able to add more valuable feedback. I am also getting same issue. Is it a bug in your gitbucket system or we need to do anything at our side? Same problem with me. Is there any solution? same error. are there any estimation time to solve it? Following way I have solved it. Go to your fork repository. Click compare from left side menu. Compare fork repository with main repository. Then it will show the commits. Set main repository as source and fork repository as destination. Click the Merge button of upper right corner. Thanks Maksud Hossain it's working. @maksud-EB Thanks your solution worked! Same problem here... cannot merge from the main repo. Had to use source tree, add new remote and pull from the remote. All of my forks have this problem. I'm still getting same error regardless of the solution @maksud-EB proposed above. Please examine this problem. Thank you, @Rajib Sarwar for detailed explanation! Oh, I've finally reached an understanding. "Sync now" link still doesn't work, but we have an alternative way to "sync", which is "compare and merge". Thank you @Rajib Sarwar and @maksud-EB ! Thank you very much @my-EB and @maksud-EB . Really saved my day. Yes, thank you indeed, @my-EB and @maksud-EB , that screenshot helped a lot! 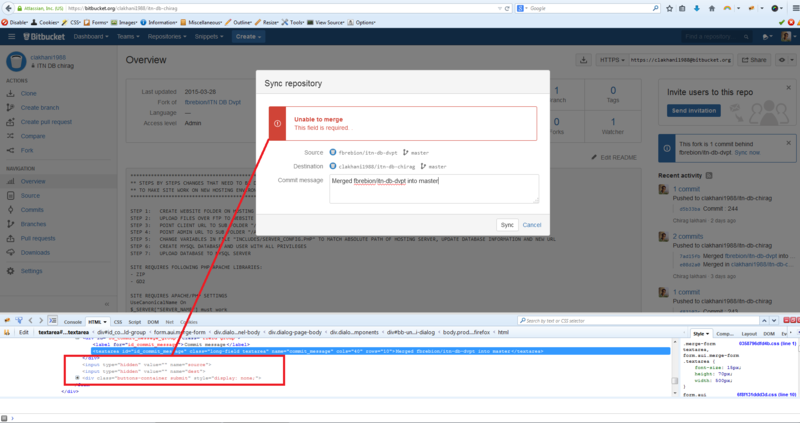 i was also able to merge via @maksud-EB 's comment: https://bitbucket.org/site/master/issue/8835/unable-to-merge-this-field-is-required#comment-17021184 but Sync at the Overview page is still broken. I have same issues with few repos. Thank you, @my-EB and @maksud-EB, that workaround really helped. @maksud-EB fix works until someone else apparently merges. Then I get the same error again. It looks like nobody tried to merge via the command line... Did you check this? Broken for me too. Used to work fine for me. Started happening a few days ago. Is some one working on that? 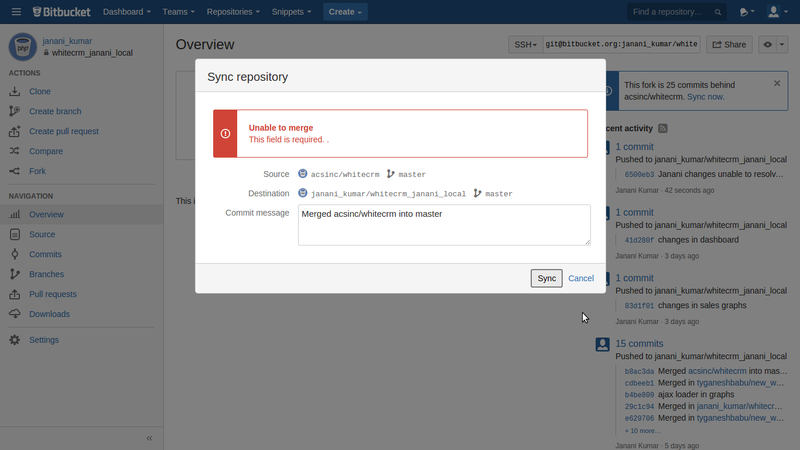 For us workflow is bitbucket unuseable for now. Issue #11159 was marked as a duplicate of this issue. Thanks for raising this issue. We are working on a fix that should be out very soon. Sorry for any inconvenience. Still not fixed I take it? Hello, our apologies. There were many duplicates of this issue. It has been resolved for some time now. If you continue to encounter issues, please raise a support request to support@bitbucket.org so that we can investigate any specific issue you may experience. Since the only response on sending a message to the above email address is a reference to https://support.atlassian.com/help/ I'll mention it here instead: the bug is back. Thanks Maksud Hossain this solution worked for me. Issue is back, can confirm, although merging via the compare interface worked. yes, We are facing the same issue again today. This issue is occuring in our end too, and I dont think we have any misconfigured branches. The issue happens suddenly. Yesterday I successfully merged my dev branch into master, but just now I did it again, the error occurred. Just wondering why. And I inspected the element, I saw there were no values for the hidden input "source" and "dest". This happened on both Google Chrome and Mac OS Safari. Having the issue myself, looks like someone broke something! Maksud Hossain's solution worked for me. Same here... just started happening today! @Marcus Bertrand seems like everyone is posting here starting today... do we need a new ticket? Support responded to my ticket and reports that they deployed a fix for the issue in production. Works for me again, now, yay!